FRAMINGHAM, Mass., July 12, 2018 – Preliminary results for the second quarter of 2018 (2Q18) showed shipments of traditional PCs (desktop, notebook, and workstation) totaled 62.3 million units, recording solid year-on-year growth of 2.7%, according to the International Data Corporation (IDC) Worldwide Quarterly Personal Computing Device Tracker. The results exceeded IDC's forecast of 0.3% growth and marks the strongest year-on-year growth rate in more than six years, when the first quarter of 2012 posted growth of 4.2%. Although helped to some extent by a weak second quarter in 2017, which was somewhat impacted by key component issues, the 2Q18 results decidedly bucked the trend from the previous three quarters, which had the market hovering slightly above or below flat growth. Once again business volume appeared to be the key driver with the top three companies reaping benefits across both desktop and notebook. Moreover, the market continued to grow for both premium as well as entry models. Chrome OS-based devices, premium notebooks, and gaming PCs all further fueled the mix in the wake of improved supply and prices of graphic cards. Not surprisingly, the recovery is relegated to the highest echelon of the market as the top 5 companies all posted positive year-on-year growth, collectively growing over 7% and capturing nearly 78% of the overall market. Scale, be it in the form of purchasing power to reduce costs, obtain scarce components, or channel reach, continued to be the catalyst for industry consolidation. From a geographic perspective, all regions exceeded forecast, with both mature and emerging markets seeing good activity. The US market delivered another growth quarter after coming in just below flat in 2017. 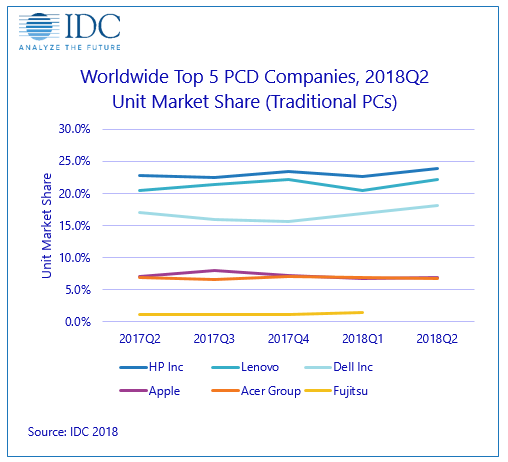 "Although traditional PCs may not be the default device for many usage scenarios, the market continues to show pockets of resiliency as PC usage experience evolves and improves," said Jay Chou, research manager with IDC's Personal Computing Device Tracker. "Even certain types of desktops are seeing growth amid this business-driven refresh cycle." "Results for the first half of 2018 have been encouraging for the US PC market despite market challenges that surfaced including expected slowdown of Chromebooks amid production inhibitors," said Neha Mahajan, senior research analyst, Devices & Displays. "And with sentiment looking improved for the second half of the year, the US could deliver a strong market performance for the year." 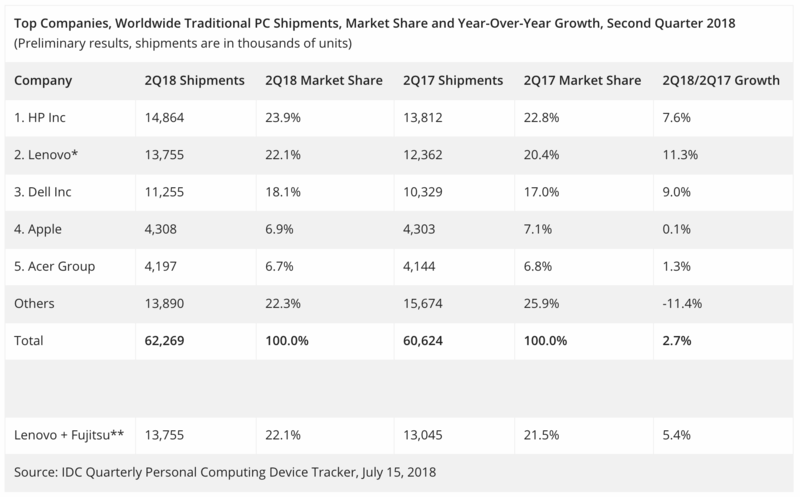 USA – The traditional PC market registered its second consecutive quarter of year-on-year shipment growth with a total of 17.3 million units. The desktop market saw shipments rising after a long decline with growth being driven by increased commercial purchases and supported by growing consumer demand for gaming systems. The enterprise shift to Windows 10 and an overall positive economic environment also helped maintain momentum on the notebook side. Europe, the Middle East and Africa (EMEA) – The traditional PC market experienced modest growth, owing to a further wave of device renewals in the commercial space. Despite the trend toward mobility, desktops once again played a strong role in driving the overall performance of the market. Asia/Pacific (excluding Japan) (APeJ) – The traditional PC market came close to IDC's forecast, supported by positive results in India, where better than expected consumer demand and good traction in the commercial market drove shipments. Meanwhile, the Department of Education project contributed to a strong increase in the commercial space in the Philippines. The PC market in China performed above expectations, as better than forecasted sales and the launch of new models during the 618 Festival contributed to higher sell-in of consumer notebooks. On the other hand, the China commercial PC market remained impacted by weak shipments to SMBs and the public sector. Japan – The market came in above expectations as commercial demand helped desktop and notebooks alike to exceed the forecast. HP Inc. continued see results from its strong portfolio and execution. It extended its streak of consecutive quarters of year-on-year growth, further cementing its hold over all others in the market. HP Inc. grew 7.6% on the year with growth in all regions. Lenovo whose majority stake in its joint venture with Fujitsu took effect in 2Q18, came off with a good start. The company rode the wave of healthy refresh momentum in Japan as well as recovering channel efforts in North America to grow 11.3% year on year (which includes Fujitsu volume beginning in 2Q18). All regions showed year-on-year growth. Dell Inc., following a good 1Q18 result, posted strong growth of 9.0%, buoyed by strong performances in nearly all regions. Apple finished the quarter in the 4th position with nearly flat year-on-year growth. Acer held the 5th position, growing 1.3% year on year. Its focus on gaming and Chrome continues to help, but weakness on the commercial side also deprives it of much of the current market momentum. *Starting in Q2 2018, Lenovo volume includes Fujitsu as per their joint venture. **For year-on-year comparison, an extra line has been added below the table to show what Lenovo's growth would have looked like had its acquisition of Fujitsu been completed prior to the start of the 2Q18 quarter.